The Spinners swept away the Lake Monsters in a quick two game series by having an offensive clinic Sunday, putting up 16 runs on 15 hits. Every Spinners starter reached base at least once, as the top three hitters in the Spinners line-up combined to go 8-for-16 with two walks, driving in seven runs and scoring eight. Derrik Gibson and Shannon Wilkerson recorded three-hit games, while Ronald Bermudez, Ryan Westmoreland and Michael Almanzar added two hit games. Bermudez led the Spinners with four RBI while Wilkerson added three RBI. Gibson, Westmoreland, Willie Holmes and Almanzar also each recorded two RBI games. For Westmoreland, he hit his team leading sixth home run, and his fourth home run in his last seven games. The Spinners are now tied with Vermont in second place at 19-17, just two games back of 1st place Oneonta and a half game back in the Wild Card race behind Hudson Valley and Williamsport. The Spinners look to continue their winning ways when they start the first part of a home and home series vs. Tri City. First pitch is scheduled for 7:05 with Kason Gabbard getting his third rehab start, he will be followed by Jose Alvarez. The Spinners were swept in the brief two game series against the Lake Monsters by dropping Friday night’s game 4-1. Spinner’s starter Ryan Pressly cruised through the first four innings without allowing a hit before getting into trouble in the 5th. Pressly only allowed one run on one hit while striking out four. The Spinner offense was silenced by Lake Monsters pitchers Peter Lehman and Evan Bronson, only mustering 5 hits. Ronald Bermudez collected the Spinners lone RBI and went 2-3 in a losing effort. Bermudez has been hot as of late hitting .353 in his past 10 games. Pedro Perez took the loss as he allowed three runs in his 2.2 innings of work. The Spinners, by losing the quick two game series against Vermont, fall to 2.5 games out of first, behind both Vermont and Oneonta. The Spinners have now lost their last four home contests. Alex Wilson looks to play the role of stopper for the Spinners as they start a four game road trip tonight in Vermont, first pitch is scheduled for 7:05. The Vermont Lake Monsters downed the Spinners 5-2, Thursday night during a damp and frustrating night for the Spinners. Starter Cesar Cabral pitched the first inning and came out of the game due to an injury sustained on Adam Amar’s shot off his leg. Once again the Spinners defense plagued them as they committed four errors on the night. These errors all either directly or indirectly led to the five Lake Monster runs. The Spinners got on the board in the 4th as Derrik Gibson walked, and streaking Ryan Westmoreland singled, to move Gibson to 2nd. With Michael Almanzar batting, a double steal was pulled off by Gibson and Westmoreland, with Gibson scoring on an errant throw by Vermont catcher Sandy Leon. The Spinners would conclude their scoring when Westmoreland cracked his 5th home run of the season deep over the right field fence in the sixth inning. For Westmoreland, he has now hit three homeruns in his last four games, and has an OPS of 1.018 for July. Justin Masterson took in the game on his bobblehead night, throwing out the first pitch. We would like to thank Justin for always remembering his friends here in Lowell. The Spinners look to split this short two game series with the Lake Monsters tommorow at 7:05 as Ryan Pressly looks to bounce back from two rough starts in a row and pick up his fourth win on the year. 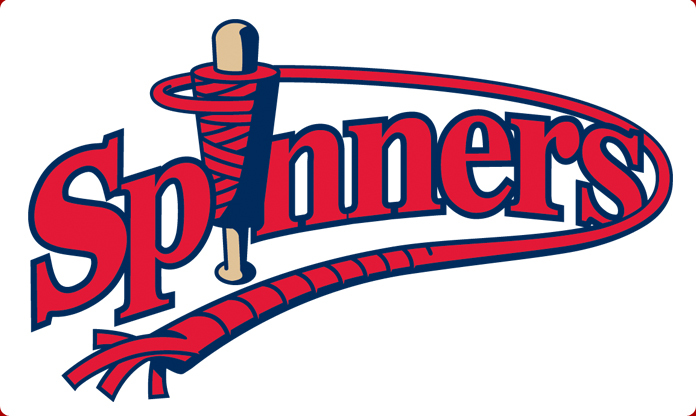 Due to a rainout of Saturday’s game, the Spinners played two yesterday in Vermont. In the first game the Spinners won 4-0, and Jose Alvarez pitched six scoreless innings, allowing only three hits for the win. Michael Almanzar and Ryan Westmoreland led the offense for the Spinners as both had multi-hit games. In the second game the Spinners were stymied by Vermont starter Mitchell Clegg and the Lake Monster bullpen as the Spinners only mustered four hits, two of them being doubles by Tom DiBenedetto and Drew Hedman. Michael Almanzar and Chris McGuiness went back to back in the 4th inning and the Spinners took advantage of 5 Lake Monsters errors to win 10-3 on Friday night. Yeiper Castillo pitched another solid game going 6 innings, allowing 1 run and striking out 5. Ryan Westmoreland continued his streak of reaching base in every game this season by lacing his 4th double of the season. Richie Lentz ran into a bit of trouble in his 1.1 innings of work but struck out 4. The Spinners look to continue their hot streak tonight against the Lake Monsters at 7:05. Jose Alvarez takes the mound in search of his second win of the season.